I can’t believe that I haven’t posted since November. Once the holidays get rolling it becomes so hectic. And, there ya go, it’s January. You may know that Jack Russell Terriers are incredibly curious. Misha is no exception. Bring a new bag into the house and my dog must inspect it. She had to see every decoration as it was brought out, but other than that she didn’t bug the decorations, the tree, or the presents. We all survived the holidays without incident. Good doggie! 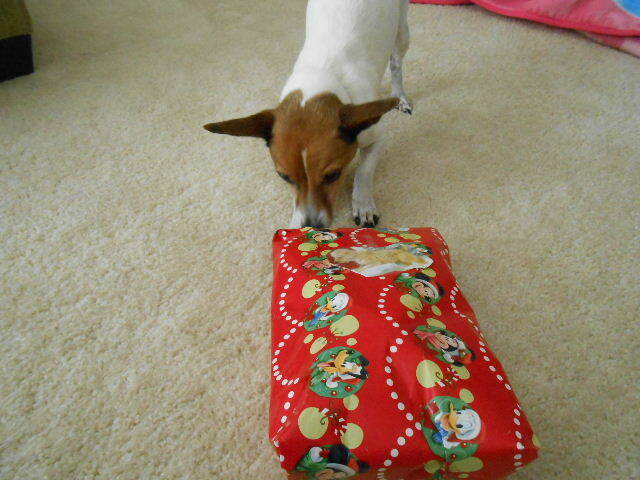 Does your dog get a present for Christmas? Mine does. Christmas Eve, she got to open hers. Misha isn’t all that great at opening presents. She sort of gets the concept, but if a human helps and the paper rattles too much she bolts. Got to love a scaredy dog. Eventually, she makes head way. Good thing she only gets one or two presents or we’d be at this all day. 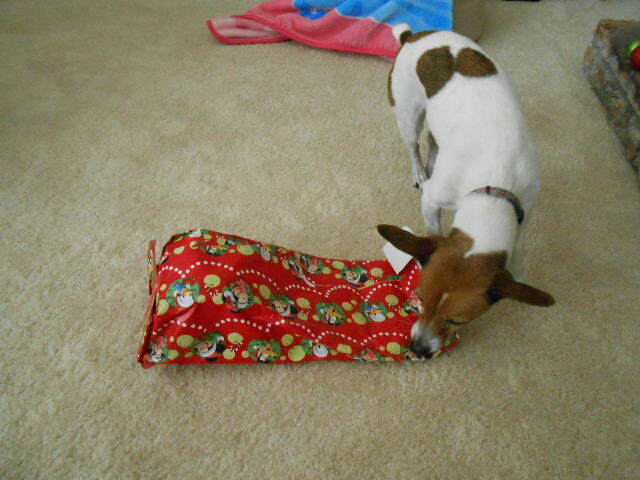 Will my dog ever open this present? She came with us to a small family Christmas Eve dinner. 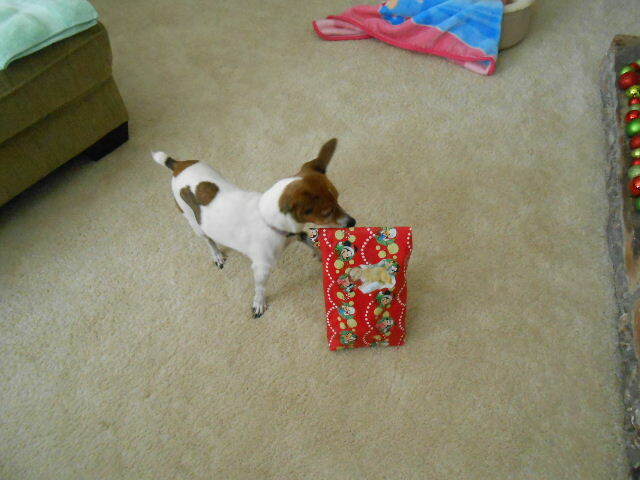 Then, Christmas morning she was in the middle of the gift unwrapping and eating scraps of breakfast from the floor. She enjoyed having family over. We took her to my niece’s for Christmas dinner, too. She stayed until dinner time. I put her in her crate so we could eat in peace and didn’t see her again until we came home. She was zonked out! 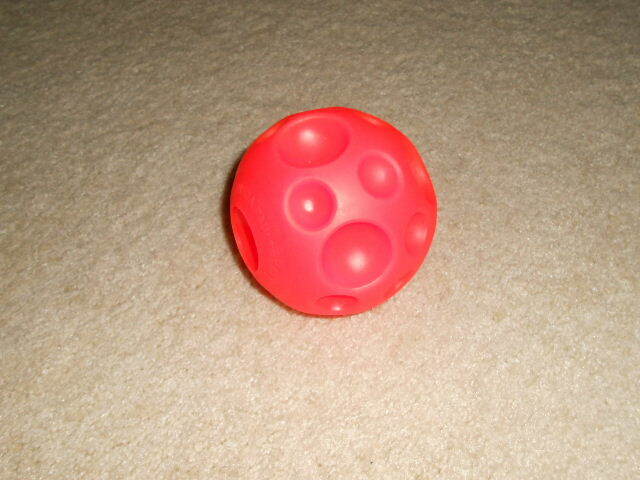 Yes…you can tire out a Jack Russell! Midget Dog, as I like to call her, would like to wish everyone a very Happy New Year! May it be a year of long walks, tasty treats, and dog induced laughter.